Diabetes drugs have varying success from person to person. New research conducted by Hariom Yadav, Ph.D., an assistant professor of molecular medicine at the Wake Forest Baptist Medical Center, studies have suggested that gut bacteria is a key indicator to a drug’s success. This research suggests a correlation between medication effectiveness and the gut bacteria of a person with Type 2 Diabetes. Metformin on the other hand works best when given orally. Based on the study, researchers believe that the individuals’ gut bacteria are affecting how well a person metabolizes the medication. The study focused on whether or not the microbiome “boosted or inhibited” the effectiveness of the medication. “Our review showed that the metabolic capacity of a patient’s microbiome could influence the absorption and function of these drugs by making them pharmacologically active, inactive, or even toxic,” said Yadav. Although this field of research is only about 10 years old, there are strong signs that our gut microbiome play a key role in our overall health this may include how we interact with medication. 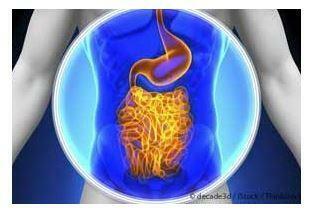 Yardav plans to continue to study the gut bacteria as it relates to the treatment of disease. This one-hour complimentary journey will expand your view of how trillions of bacterial hitchhikers profoundly influence our health. We will discuss how foods, the environment and our medical practices have impacted our gut bacteria over time and strategies we can take to protect these old friends. You can either view the webinar for free, or to receive additional CEs, purchase the webinar. This webinar is free and you can view at any time, on any device. Our Diabetes Detective Team scans the diabetes news to discover the most relevant info that Diabetes Educators need in their daily practice. We post one daily Blog Byte from Monday to Friday. And of course, Tuesday is our Question of the Week. It’s Informative and FREE! Sign up below! Such a tragic story of a young man’s life cut short because he couldn’t afford his insulin. 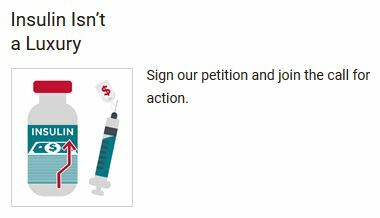 Sign the ADA Petition to make insulin affordable. We can make a difference starting today! Test your medication knowledge with our four complimentary quizzes. We designed these medication quizzes to give you a feel for the medication questions on the exam and also to keep you up to date on medication updates in Diabetes. Featuring our downloadable Medication PocketCards, 10 Steps to Succeed, Free Webinars and more! You can now sign up to receive our blog posts in your inbox – Click here to sign up. According to a statement made recently by Eli Lilly, they have submitted a nasal glucagon treatment to the FDA. The treatment would be for cases of severe hypoglycemia in adults and children with diabetes. This treatment would be the first of it’s kind, a nasal spray, to treat low blood glucose emergencies in those with diabetes. “The submissions put us one step closer to bringing this innovative rescue medicine to the diabetes community and filling an important need in the treatment of severe hypoglycemia,” said Thomas Hardy, Senior Medical Director, Lilly Diabetes, told Endocrine Today. The way glucagon is currently administered can be a complicated process, requiring the administer to reconstitute the powder and other steps. This can be a confusing process, particularly if you are a caregiver a a child with diabetes. 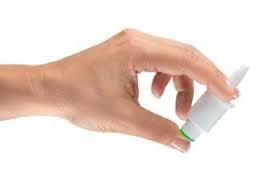 The new nasal glucagon would deliver the medicine in a powder form in an easy, ready to use format. Many people already understand how to use nose spray, making this functional but also realistic in a hypoglycemic emergency. This advanced level course is designed to help participants determine the best medication choice based on the patient’s unique characteristics. The content incorporates the management guidelines published by the American Association of Clinical Endocrinologists (AACE) and the American Diabetes Association (ADA) Algorithms. We will discuss the role of lifestyle changes and review the pros and cons of available diabetes medications using a patient centered approach. In addition, we discuss the medication algorithms in detail. Participants not familiar with the basics of diabetes medication, may benefit from first enrolling in our “Meds for Type 2” and “Insulin 101 Course.” 90-minute course. The importance of patient assessment in determining a realistic meds management plan. Intended Audience: A great course for health care professionals seeking to enhance their knowledge of hyperglycemia management for those living with type 2 diabetes. New & Update Medication Update Webinar is now available! Feeling overwhelmed by all the new recently approved diabetes medications? Two bio-similiar insulins are now available and another GLP-1 RA was just approved. Plus, 2 new combo oral meds are now available. Are you wondering how to apply the new 2018 ADA and AACE Medication Management Guidelines into practice? We are here to help out with our newly recorded Medication Update 2018! This webinar will discuss how to integrate these new medications into our practice. We will discuss the benefits and limitations and critical information to share with our patients and providers. If you want cutting edge information on the latest pharmacology and hospital glucose management, we highly recommend this Meds Update. All video presentations and podcasts available now On Demand. Includes both courses, free podcasts, handouts, resources and CE Certificates. 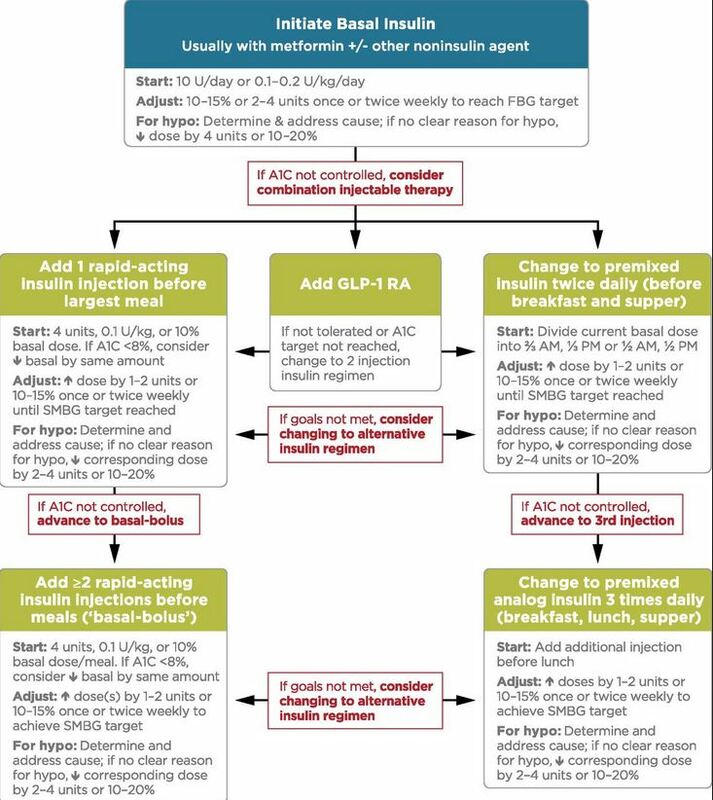 This updated version of Meds Management includes more detailed information on insulin therapy for Type 1s. They note that sensor-augmented insulin pump therapy with the threshold suspend feature reduced nocturnal hypoglycemia without increasing A1c (for type 1s in a 3 month randomized trial). The FDA approved the first hybrid closed-loop pump system, since the literature supports its safety and efficacy. Add on Metformin for Type 1 – In several trials, adding metformin to insulin for type 1s, reduced insulin requirements 6.6 units a day and led to small reductions in weight and LDL cholesterol. However, it did not significantly reduce A1c. Metformin in not FDA Approved for use in patients with type 1 diabetes. SGLT-2 Inhibitors – these “glucoretics” lower glucose by decreasing renal reabsorption of glucose in the proximal tubules. Since this class works independent of endogenous insulin, SGLT-2 Inhibitors may benefit patients with type 1 or type 2 (not FDA Approved for use in patients with type 1 diabetes). However, the FDA has issued a warning of the risk of ketoacidosis occurring in the absence of significant hyperglycemia. There are many reported cases of euglycemic ketoacidosis in patients with type 1 or type 2 diabetes. If patients are experiencing signs of ketosis, instruct them to immediately stop taking the SGLT-2 and seek immediate care. 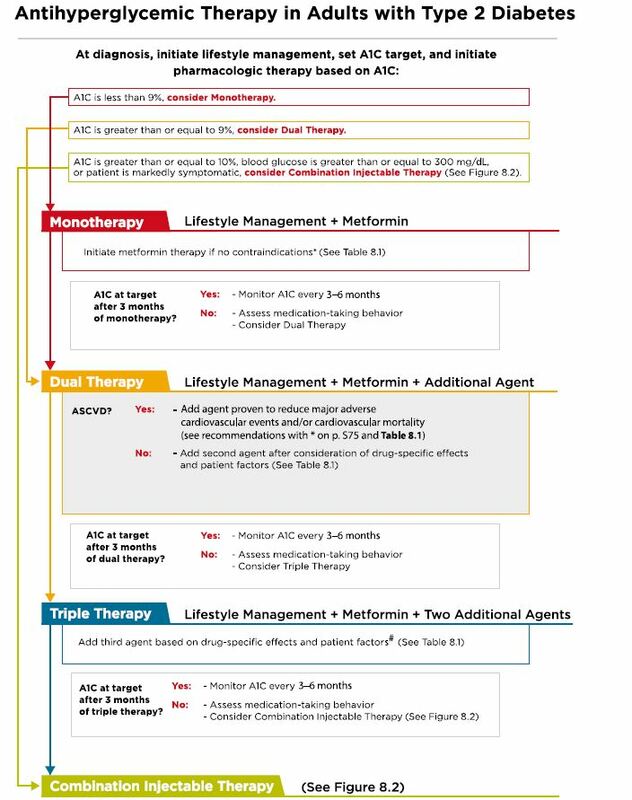 Pharmacologic Approaches to Glycemic Treatment 2018. This hyperglycemia road map details strategies to achieve glucose control for both Type 1 and Type 2 Diabetes. Section 8 of Standards of Care, Dec 2018. 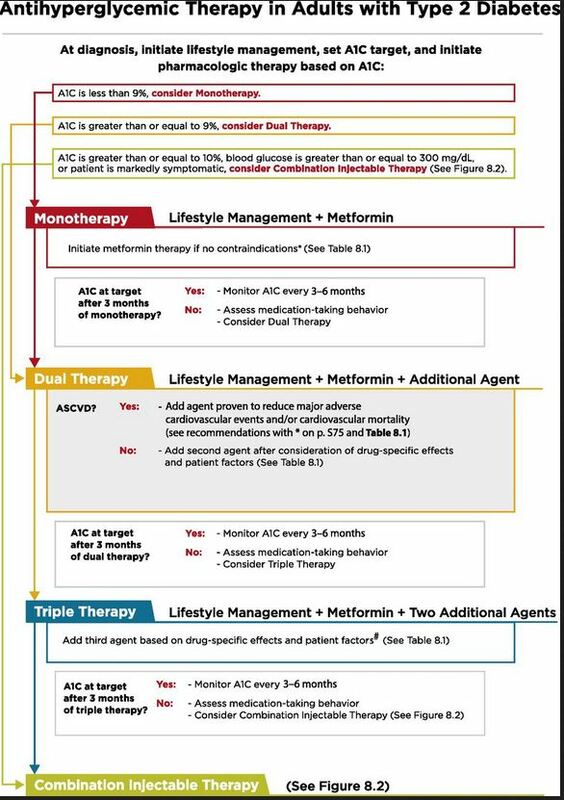 According to the ADA 2018 Standards, section 8, Metformin therapy should be started along with lifestyle Management at diagnosis of type 2 Diabetes (unless contraindicated). Metformin is effective, safe, inexpensive and may reduce risk of CV events and death. If A1c target is not achieved after 3 months, consider metformin and any one of the six preferred treatment options based on drug specific effects and patient factors. If A1c target is still not achieved after 3 months on metformin, and the patient has CV Disease, consider adding a second agent with evidence of cardiovascular risk reduction (based on drug specific effects and patient factors). If A1c target is still not achieved after 3 months, combine metformin plus two other agents for a three-drug combination. If A1c target is still not achieved after 3 months, add combination injectable therapy to the three-drug combination. For all steps, consider including medications with evidence of CV risk reduction, based on drug specific effects and patient factors. If A1c is greater or equal to 10%, or if BG 300 or more, or pt is markedly symptomatic, consider insulin and injectable therapy. The Food and Drug Administration (FDA) has approved Ertugliflozin (Steglatro), a new SGLT-2 Inhibitor to treat adults with type 2 diabetes. Also approved are two new combination medications with ertugliflozin. These include Segluromet (ertugliflozin plus metformin) and Steglujan (ertugliflozin plus sitagliptin). See box below for available combination doses (in mgs). Dosing range: 5 -15 mg daily. Monitor GFR before starting. Don’t start med if GFR is less than 60 and stop if GFR is less than 30. 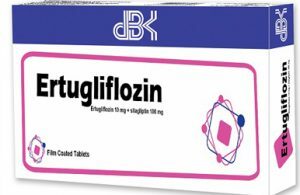 Considerations: Ertugliflozin has the same warnings as other SGLT-2s: Watch for hypotension, UTI’s, increased urination, genital infections, ketoacidosis. Benefits: no hypoglyecmia or weight gain. Lowers A1c 1.0% – 2.0%. Lowers wt 1-3 lbs. This webinar will discuss how to integrate these new medications into our practice. We will discuss the benefits and limitations and critical information to share with our patients and providers. If you want cutting edge information on the latest pharmacology and how to incorporate the new ADA Guidelines into practice, we highly recommend this Meds Update. Purchase Meds Update 2018 Course – 1.5 units for $29 from our Diabetes Education Online University. Meds Update Course 2018 – cutting edge information on the latest pharmacology and how to incorporate the new ADA Guidelines into practice. 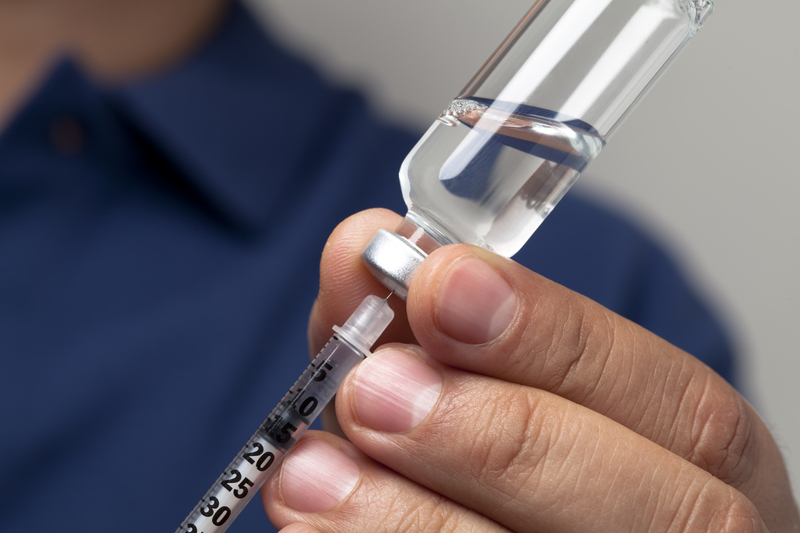 Basal-bolus Insulin in the Hospital Setting Course – A comprehensive program which explores the effective use of basal bolus insulin in the hospital setting through case studies and examples. 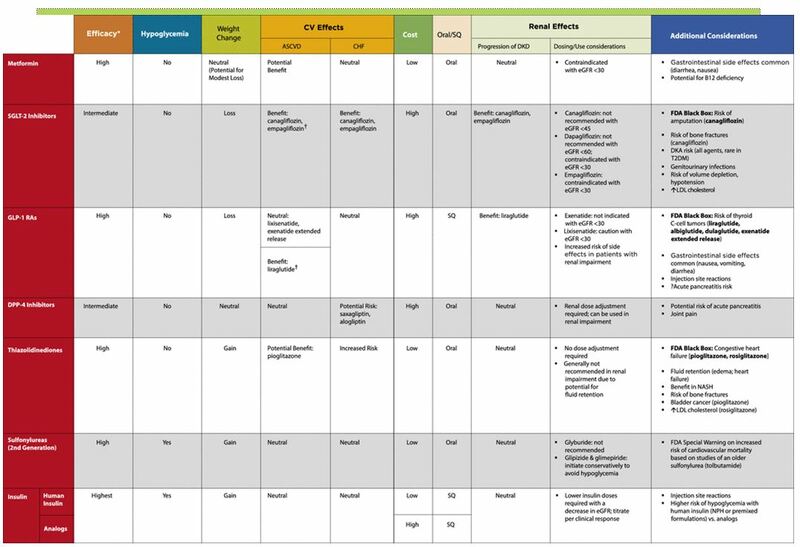 If you want cutting edge information on the latest pharmacology and hospital glucose management, we highly recommend this Meds Update Toolkit. The Food and Drug Administration (FDA) has approved Admelog (Sanofi-Adventis US), the first copycat version of short-acting insulin lispro (Humalog, Eli Lilly) to treat individuals aged 3 years and older with type 1 diabetes and adults with type 2 diabetes. Approved for use as an injection, via pump, or intravenously. It will be available both in vials and as a prefilled pen (Admelog SoloStar). The FDA approved Admelog through an abbreviated approval pathway under which companies can rely on the FDA’s previous approval of a drug as safe and effective or on previously published literature supporting safety and/or effectiveness. This process is meant to reduce drug development costs in order to reduce the drug’s price on the market. If you want cutting edge information on the latest pharmacology, we highly recommend this Meds Update.